I have been very busy, and cooking has become a luxury recently, but I can still whip up something healthy that does not take a great deal of time or effort. 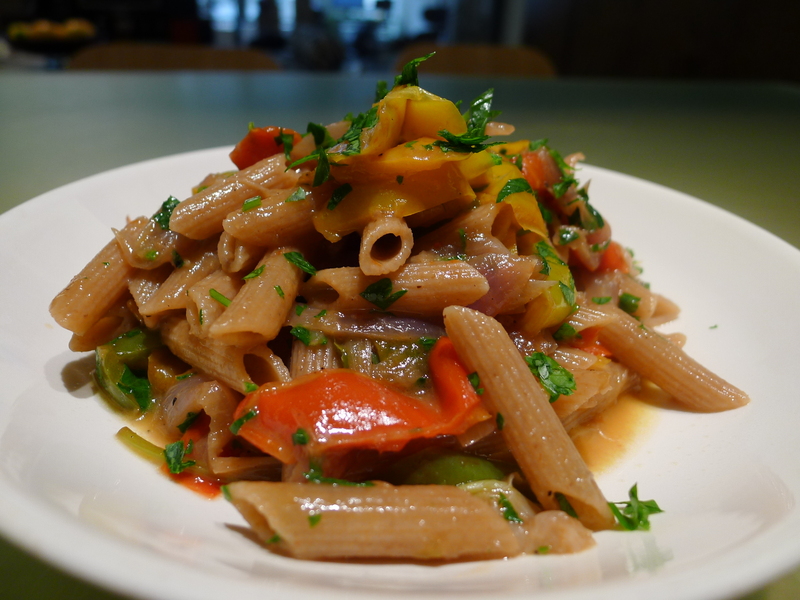 Here is a great vegetarian lunch dish with yummy bell pepper base sauce. An addition of crème fraîche makes the sauce mottled and gooey, although not necessary. *I used the whole wheat penne, but I think the whole wheat pasta is not exactly the best match for this delicate sauce. Fill a large pot with water and start boiling the water on a low flame. Salt the water generously. Put all peppers in a large saute pan with olive oil, salt and pepper. Place the lid on, and cook the peppers slowly on a low flame until the peppers become completely soft for about 15 minutes. Add the onions and cook softly another 20 minutes until everything looks almost caramelized. Add garlic and some of the parsley. Season with salt and pepper. Add balsamic vinegar. Bring the water in roiling boil and cook the pasta al dente. Add crème fraîche to the sauce. Add cooked pasta with a little bit of pasta water to the sauce. Add parmesan cheese. Finish with a bit of extra virgin olive oil and rest of the parsley. This entry was posted in Recipes and tagged lunch, pasta, pepper, vegetarian. Bookmark the permalink.